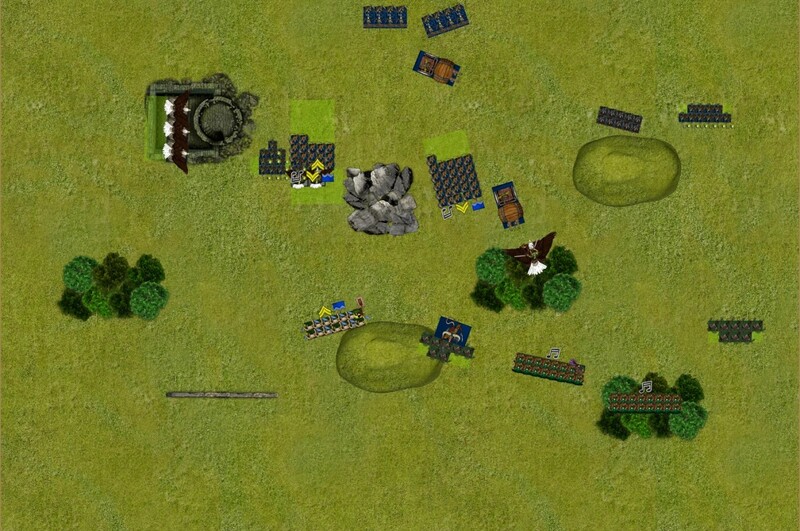 I was now faced with a difficult decision: with the Totemic Summon ready to flank one unit of jezzails and overrun into the other, I figured that the safest place to be with my fast units was in combat. 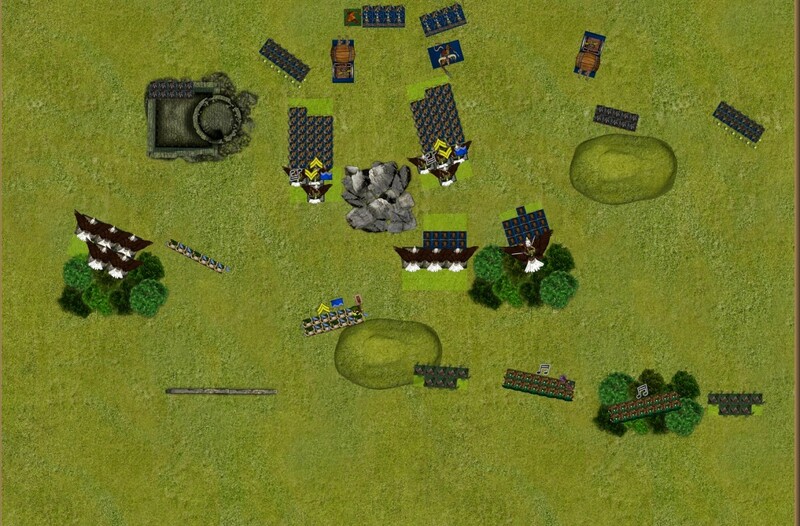 The two Rat-at-Arms units were close enough to the Kestrels, and the support units were too far away, meaning that I’d get at least 3 rounds of combat before any help came their way. After a lot of deliberation, I took the charges: each kestrel unit charged into one of the Rat-at-Arms units respectively, while the Eagle Prince saw the opportunity to kill the machinist and charged the Giant Rats just in front of the forest. The Totemic beast fell into the flank of the jezzails. Unfortunately, the Giant Eagles failed their charge against the leftmost footpads and moved up a bit(this charge would serve a double purpose: potentially deal with the only scoring unit in that flank, but also pull the Plague Disciples out of position so that my small dancers could help out against the R@A). I spent all of my magic trying to boost the kestrels fighting against the character bunker, and managed to get the Forest Embrace off. 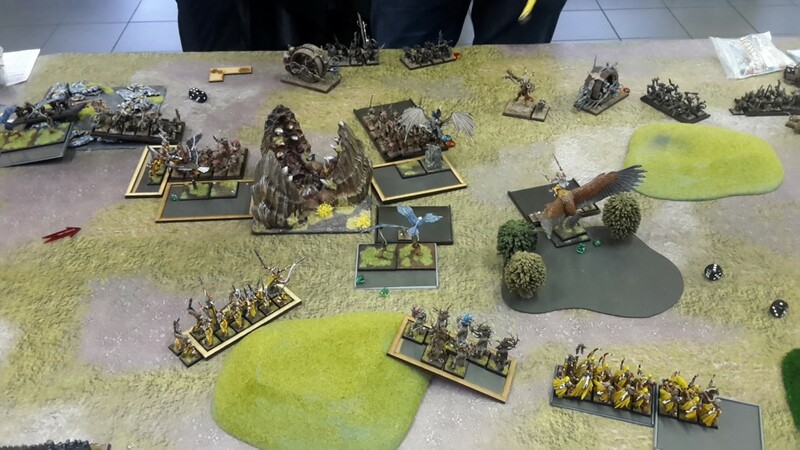 Shooting was focused on the rightmost disciples (the only thing blocking my dryads’ advance), two plague rats falling to the sylvan arrows. In combat I focused all of my kestrel riders’ attacks on the meat grinders, and managed to kill both of them. This meant that the rats at arms were now a lot less potent in combat, and the kestrel mounts proceeded to grind some rats down too. The magister also took a couple of wounds, helping me win that combat convincingly. As expected, both rat-at-arms units held their ground. The Prince managed to kill the machinist outright, while his eagle started stomping on rats. The Forest Eagles still battled on against their giant rant adversaries, now only 10 rats and 3 eagles remained! Finally, the totemic beast fluffed against the jezzails; my luck had run out, and the summon failed to deal a single wound to the rat shooters! Thanks to the Vermin Daemon’s proximity they held, pinning the beast down for a dreadmill countercharge. 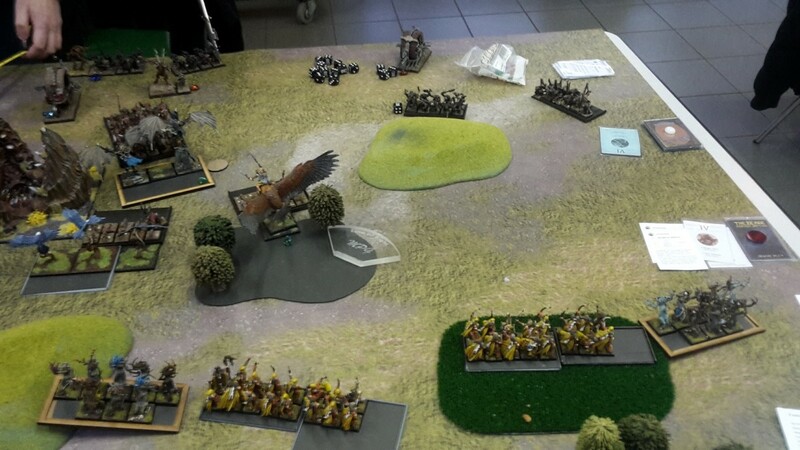 The dreadmills charged into the totemic summon and the rightmost kestrels respectively; the latter was a very long charge that failed to connect. The vermin daemon and the left disciples maneuvered into position for turn 3 charges against the kestrel units. In magic I used my Binding Scroll on the Swarm Awakens, then I let an unerring strike through on the left dryads, which thankfully only killed one forest spirit. This allowed me to dispel both Know thy Enemy and the Stars Align, effectively shutting down the vermin magic phase! Shooting resulted in a further wound into the Forest Prince from the four unengaged jezzails. The leftmost kestrel combat was a stalemate, the rats killing a kestrel but suffering a lot of casualties back: only two kestrels remained in combat now! To the right, the kestrels managed to kill off the Magister and carried on the fight, also losing a kestrel to the rats’attacks. The Prince hacked and slashed some more and stayed locked in combat, and the Forest Eagles also killed some rats, but not enough to break steadfast. Finally, the Dreadmill predictably killed the totemic beast and reformed, freeing up the jezzails for some more shooting. The leftmost eagles now succeeded in charging the Footpads, taking a casualty from stand and shoot and dangerous terrain tests. The small bladedancer unit flanked the left rats-at-arms, and with that a big part of my army was locked in combat! 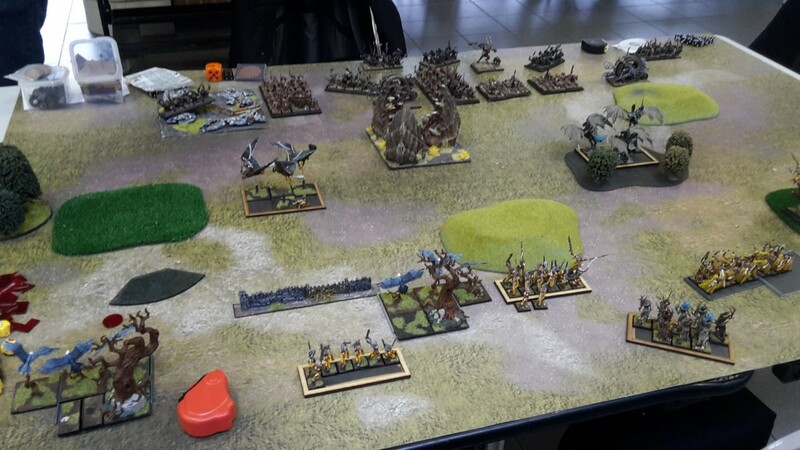 The bigger dancers moved up to threaten the weaker left flank, and the archers and dryads shuffled a bit. Magic only saw me cast the Insect Swarm on the rightmost Dreadmill, causing two wounds. The totemic summon was scrolled and the combat buffs either failed to cast or were dispelled. Shooting only amounted for one more wound on the dreadmill, the rest of the shots bouncing off harmlessly. 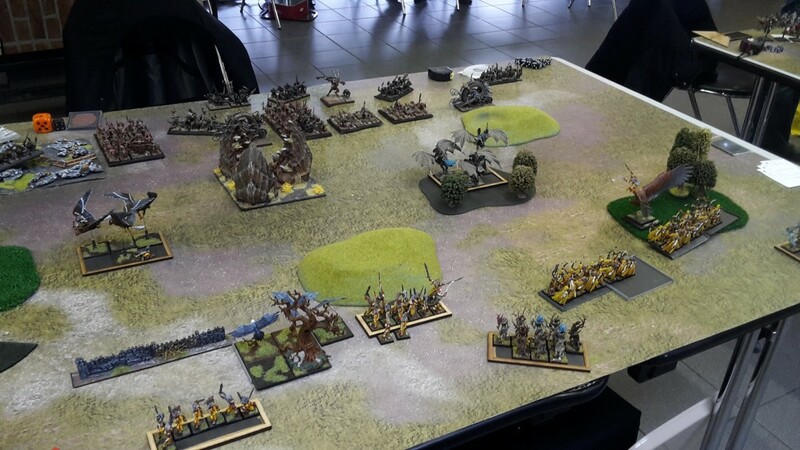 The rats now went on the offensive: the disciples flanked my bladedancers, the dreadmill on the right flanked the middle kestrels and the Vermin Daemon spotted the Forest Eagles, a comfortable 14 inches away and with a good overrun path into the dryads right behind. All of the charges succeeded, turning the tables slightly! 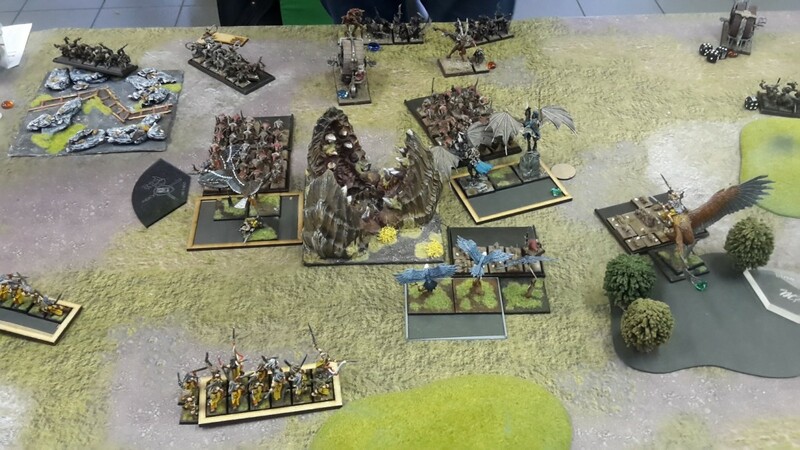 With the magister dead and the vermin daemon engaged in combat, magic was pretty uneventful: I dispelled Know thy Enemy and the the Stars Align failed to cast. Shooting was now unable to hurt my Forest Prince, still fighting the rats. In the leftmost combat, the forest eagles killed all of the footpads and reformed. The kestrel/dancer/R@A/Disciple multiple combat was complicated: the bladedancers took 3++ aegis save, weathering most of the initial damage from toxic attacks. This allowed them to deal a lot of damage on the rats at arms, bringing them down to 8 strong and saving the kestrels. However, their victory was short-lived, as the retaliation attacks from the disciples were enough to kill the BD to an elf. 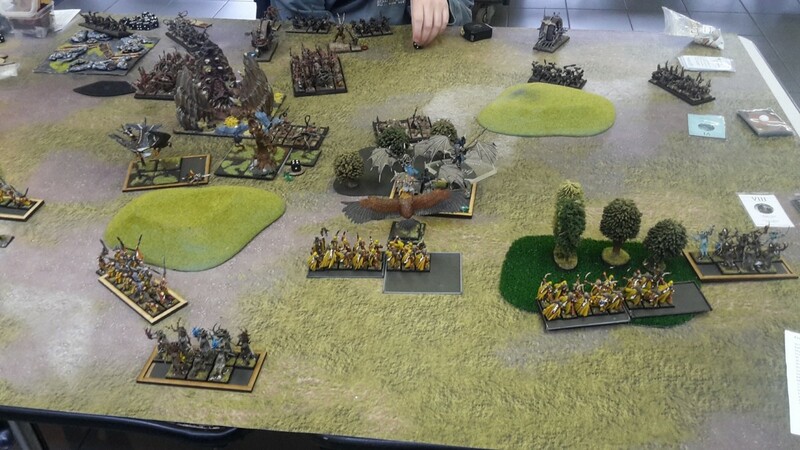 The Eagle Prince finally managed to kill the remaining rats and freed himself, while the Vermin Daemon crushed the eagles and pursued into the dryads right behind. The birds did manage to kill the last Giant Rat before fleeing and getting cut down, though! Finally, the charging Dreadmill made short work out of the kestrels, but not before they got to kill the chief BSB! With the Vermin Daemon having penetrated my battle line things were not ideal, especially as he’d probably crush the dryads and reform to charge again during the vermin turn. I briefly considered charging the Sylvan Prince into the daemon, but at 2w remaining it would have been a very risky move! Instead, the Prince went for the rat-at-arms unit, hoping to pin them down long enough so as to prevent them from scoring the objective. The big dancer unit fell into the victorious plague disciples, and the unengaged scorers shuffled a bit towards the enemy lines. In magic I decided to boost the offense of the Dryads in combat, in an attempt to deal a couple of wounds to the Vermin Daemon, making it potentially easier to kill him in later stages of the game. This would prove to be a mistake, since the Daemon did a perfect run and killed all of the dryads without suffering and wounds back! 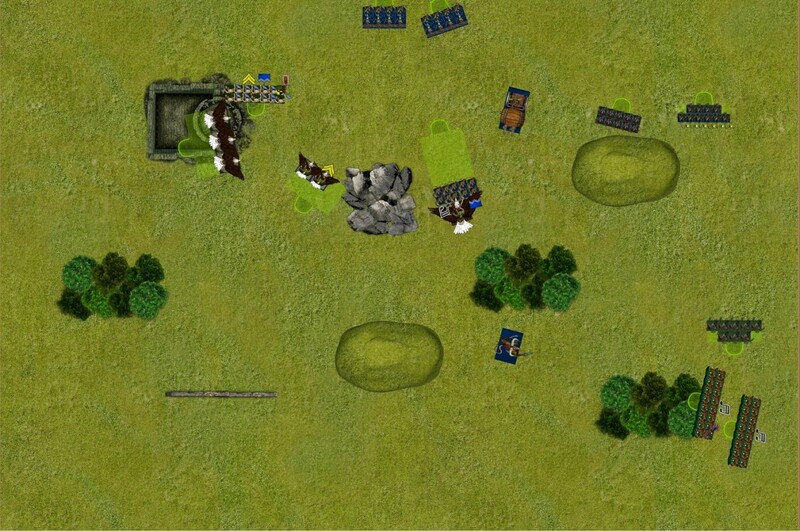 Shooting was more eventful, the two units of sylvan Archers finally managing to kill the wounded dreadmill. In combat the big bladedancers used the 3++ dance to soften the blow of the disciples’ attacks, and did considerable damage themselves. They broke the frenzied rats and ran them down. The kestrels next to them also managed to rout the rats at arms and they killed them in pursuit. The VD smashed the dryads and reformed to threaten my nearby archers. Finally, the Eagle Prince killed rats aplenty, but they held their ground. This would be our final game turn: all of the deployment, maneuvering and decision-making had taken a lot of time in this battle, especially on my side. With heavy penalties in place for delaying a round, we agreed to finish our game after the fourth vermin swarm turn, much to my opponent’s dismay. The Vermin Daemon spotted the archer bunker’s flank and declared a charge: they promptly failed their Terror Check and ran through the second archer unit, panicking it, too! Both units fled to relative safety, and the vermin daemon failed its charge. The rest of the movement was essentially inconsequential, and thus we moved on to the magic phase. 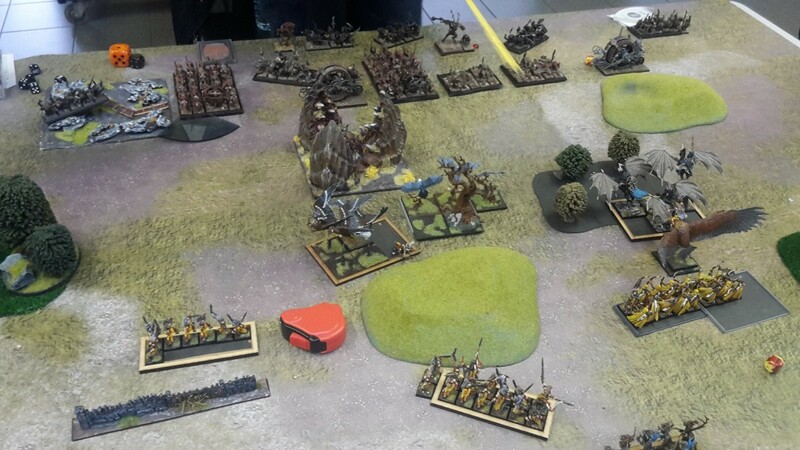 With the only viable spell targets being my remaining scoring dryads, the vermin daemon tried in vain to kill them. The Jezzails once more took aim at the Forest Prince in combat, but their shots only hit rats, leaving him unscathed. He killed some more rats-at-arms but they succeeded their break test and brought the game to a close. The final turn failed panic checks gave my adversary a much-needed victory point boost, resulting in an 11 – 9 Sylvan Elf victory! This was a very challenging and enjoyable game, unfortunately somewhat marred by the fact that we only got to fourth turn. 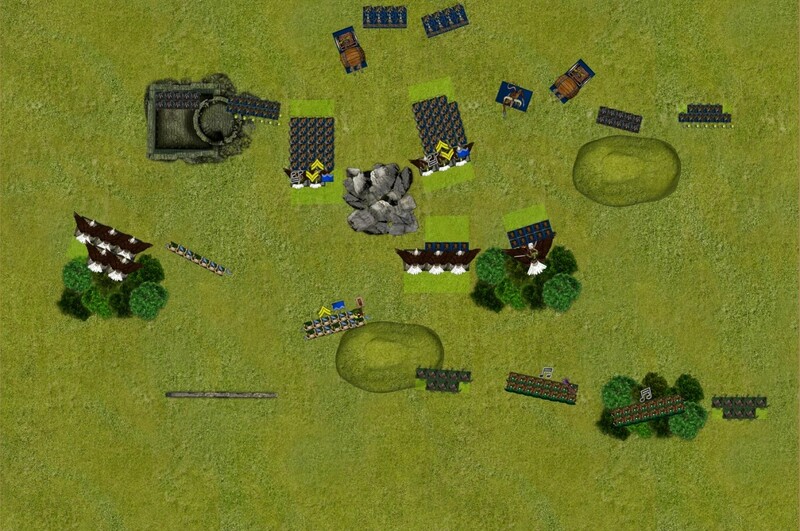 I must admit that I was responsible for that in a big part: the new army, when faced with a big tactical challenge, meant that I took a lot of time to deploy (we both did, alternating deployment)and to move for the first couple of turns. Being in combat from turn 1 also meant that we had a lot of phases to go through, with attack allocations and different initiative steps everywhere. 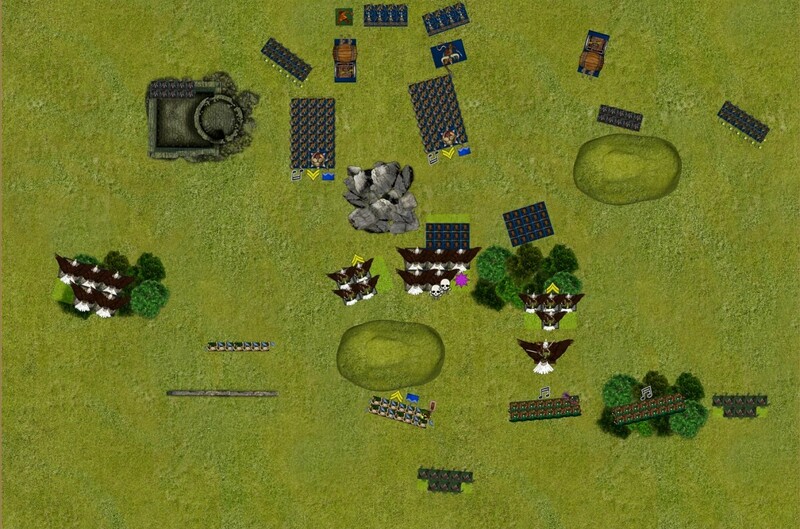 Trying to project how things would go in the final two turns is difficult, but I’d expect the vermin daemon to get at least a unit of archers (if they rallied at all), while my remaining kestrels, dancers and the Prince would probably do short work of the remaining jezzails and rats at arms. Worst case scenario, it would have been a small loss for the sylvans, which is what I had expected to get on paper. I am overall very glad with how the game played out, in that the plan almost worked to perfection: if it hadn’t been for that misplaced dryad unit on turn 3, the game would have gone even better. The fact that the kestrels managed to assassinate the meatgrinders on the turn they charged allowed them to stick for 5+ combat phases against the ranked rats, greatly hampering their ability to participate in the battle. 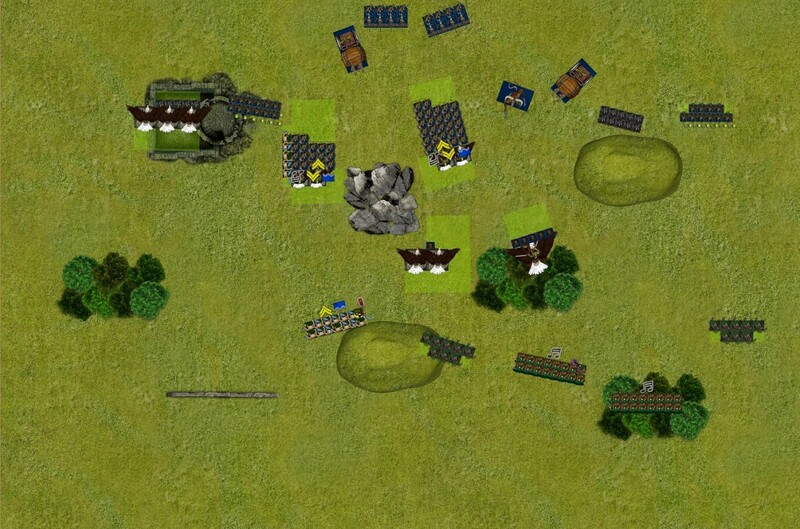 This, in combination with the use of terrain to protect the more fragile units, meant that the enemy shooting and magic didn’t have a big impact on the game. 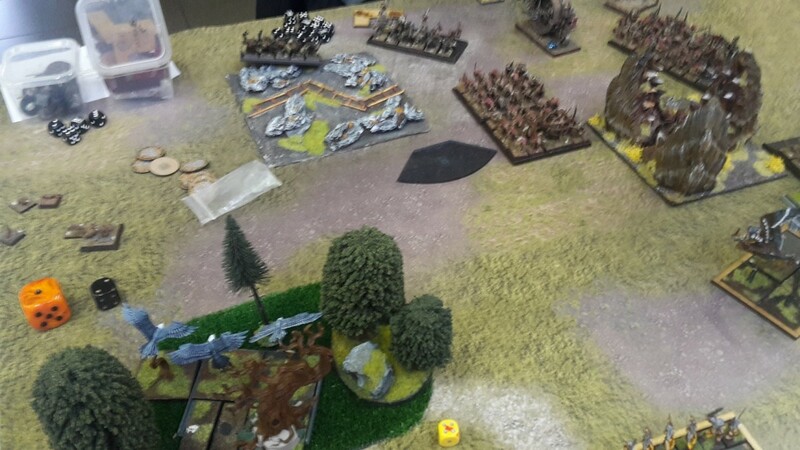 In hindsight, I could have deviated the middle dryad unit towards the weaker left flank, pushing them forward to claim the secondary objective instead of keeping them idly behind the hill for a couple of turns, then moving them forward to get charged by the Vermin Daemon. The rest of the team did a great job, both the Ogres and the UD getting big victories and our DL player settling for a draw against the KoE. So this meant that we managed to get maximum tournament points for the second game by a considerable margin. We would get to meet and play against Team Luxembourg for the third round! 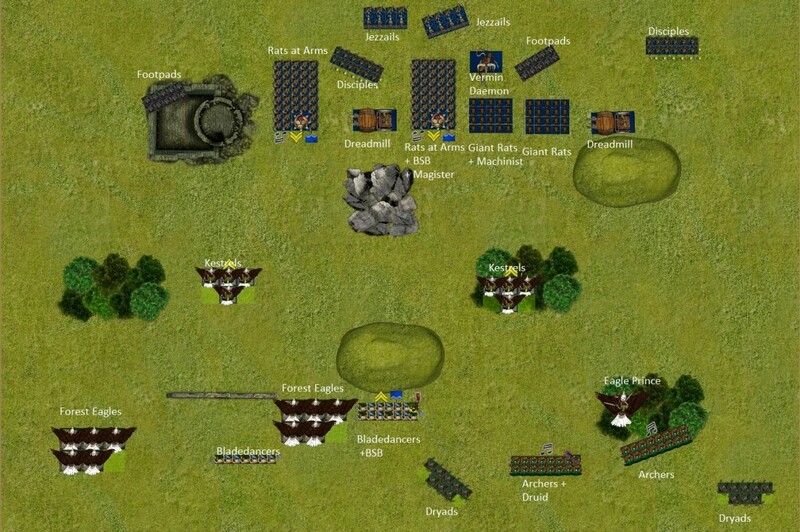 As always, one of the best battle reports that one can find in the internet. Thanks or explaining your tactics and strategic thinking. It really helps to understand the games between such good players. Thanks for the battle report! By any chance.. Around the start VS T2, did you hear anything like: ".. ça y est.. c'est foutu.. ça c'est perdu 20-0.. Bien joué Franck.."
Hahaha, it sounds oddly familiar! Fixed the images (and the words stuck together from copy-paste...), thanks! PS: did you notice that I totally stole your Eagle Prince idea?